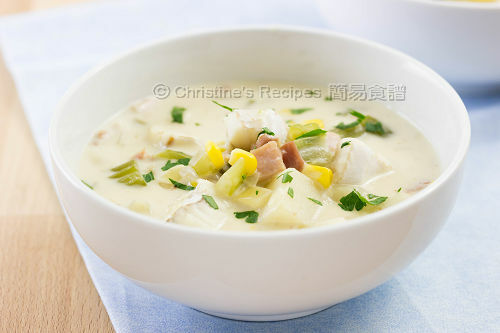 Growing up in a family with lots of fish to eat, I just enjoy any fish soup very much. 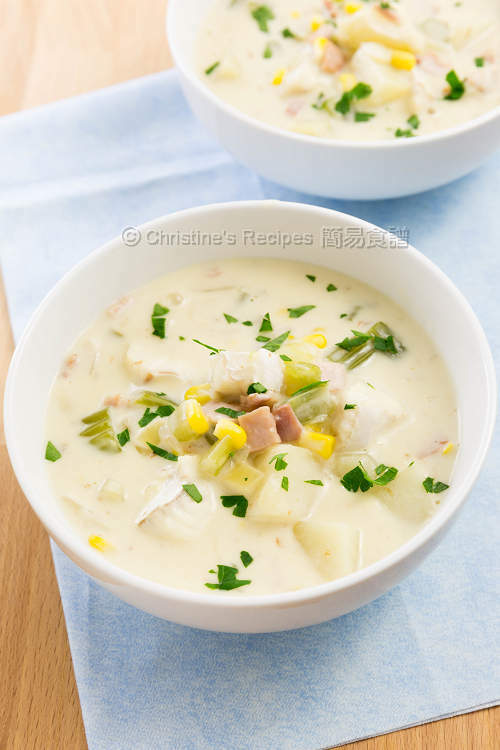 Here’s my light lunch that I had the other day, Fish Chowder Soup. This hearty and delicious soup goes really well with crusty bread or crackers. At the first glance, it seemed to be not much for a meal, I felt so full after finishing a bowl though. Once you've got all the ingredients in fridge, it’s so quick to prepare it on the go! Heat oil in a heavy-based pot over medium heat. Cook bacon until crispy. Add onion and sauté until softened. Push vegetables to sides of the pot. Add more oil in the middle and sauté garlic until aromatic. Add celery and stir fry for 1 to 2 minutes until softened. Sift in 2 tablespoons of plan flour in two batches. Combine well and cook for 1 minute. Pour in chicken stock. Add potatoes and bring to a boil, covered. Cook until potatoes are soften, yet not too long as you don’t like it mushy. Stir in hot milk. Toss in corn kennels and fish meat. Continue to cook for 3 minutes. When fish is just cooked, pour in cream. Season with salt and pepper. Garnish with parsley. Enjoy ! Any pouring cream can be used as you like, available at supermarkets. Warm up the milk in a microwave oven or in a small saucepan in advance. It helps shorten the cooking time. This looks so easy to follow, must try this out one day. Nice and simple soup. Looks delicious and creamy. Yeah, easy to cook, yummy to eat! Thanks a lot. I'll never have enough of this. another yummy looking dish to try thanks to you Christine! My kids favourite creamy soup. Love the flavour! 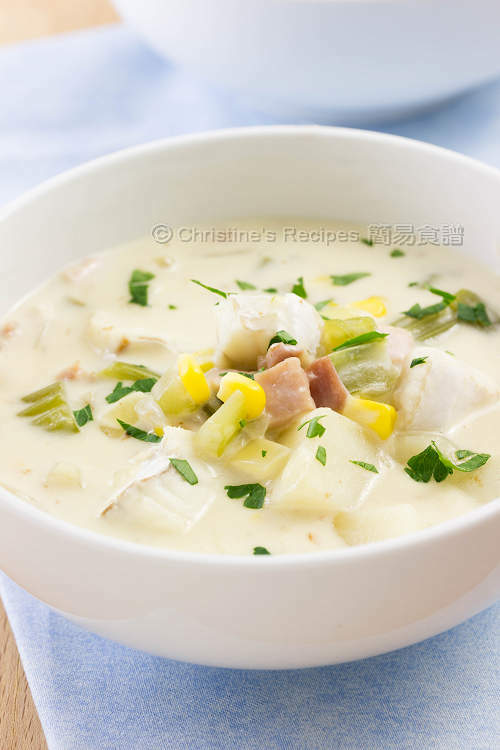 lovely soup with lots of flavors! 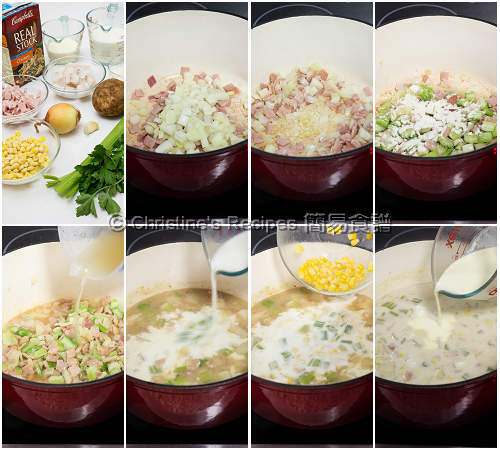 I love chowders simply because they make such wonderful soups, it is never boring. looks great and helathy too I love htis !! Your soup packed with all the nutritious ingredients. Looks so yummy! It looks super duper delicious!